The Ecological Importance of High-Severity Fires, presents information on the current paradigm shift in the way people think about wildfire and ecosystems. While much of the current forest management in fire-adapted ecosystems, especially forests, is focused on fire prevention and suppression, little has been reported on the ecological role of fire, and nothing has been presented on the importance of high-severity fire with regards to the maintenance of native biodiversity and fire-dependent ecosystems and species. 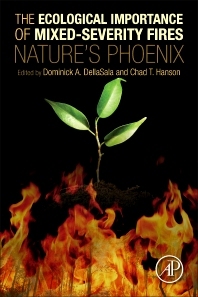 This text fills that void, providing a comprehensive reference for documenting and synthesizing fire's ecological role. 4 Just What Are Mixed- and High-Severity Fires and What Governs Them? 2.1 Just What Are Megafires? 6.2 How Do Outbreaks Affect Subsequent High-Severity Fires? 6.3 How Do High-Severity Fires Affect Subsequent Outbreaks? 6.4 How Are Interacting Fires and Bark Beetles Affecting Forest Resilience in the Context of Climate Change? 8.10 Where Is Fire Important in sub-Saharan Africa? 8.11 What About People and Fire? 13.4 To Thin or Not to Thin? Dominick A. DellaSala, Ph.D., is President and Chief Scientist of the Geos Institute (www.geosinstitute.org) in Ashland, Oregon. He served two terms as President of the Society for Conservation Biology, North America Section, and is a Courtesy Professor at Oregon State University. He is an internationally renowned author of over 200 technical papers on forest and fire ecology, conservation biology, endangered species, and landscape ecology. He received conservation leadership awards from the World Wildlife Fund (2000, 2004), Wilburforce Foundation (2006), received Choice Publisher’s “academic excellence” award for “Temperate and Boreal Rainforests of the World: Ecology and Conservation,” and is on the Fulbright Specialist roster for international placement by the U.S. Department of State’s Bureau of Education and Cultural Affairs and the Council for International Exchange of Scholars. Dr. DellaSala has appeared on nature documentaries (PBS), as an expert witness at numerous congressional hearings including acting as a “whistle blower” during congressional hearings on scientific integrity and the Endangered Species Act, and has given keynote addresses at numerous conferences and international meetings such the United Nations Earth Summit. He is motivated by his passion to leave a living planet for his daughter and all those that follow. Chad T. Hanson, Ph. D., is director and staff ecologist of the John Muir Project of Earth Island Institute. His Ph.D. is in ecology from the University of California, Davis, and his research focus is on fire ecology in conifer forest ecosystems. Studies published by Dr. Hanson cover topics such as: habitat selection of rare wildlife species associated with habitat created by high-severity fire; post-fire conifer responses and adaptations; fire history, especially historical versus current rates of high-severity fire occurrence; and current fire patterns. Dr. Hanson lives in the San Bernardino Mountains of southern California, and conducts research in conifer forests of the western United States, primarily in forests of California.